Peter Martin: The impact of the carbon tax will be how small? The impact of the carbon tax on the mining industry will be “trivial” - so small that for practical purposes it will be “invisible,” according to one of Australia’s leading labour market economists. Professor Bruce Chapman is president of the Economic Society of Australia and director of policy at the Australian National University’s Crawford school of government. In a report released this morning entitled How many jobs is 23,510 really? he attempts to put into perspective a claim by the Minerals Council that a carbon trading system would cut by around 24,000 people the number than would be employed in the mining industry. “Something like 370,000 people every month go from not having a job to having a job, and something like 365,000 people every month do the opposite,” he told the Herald. 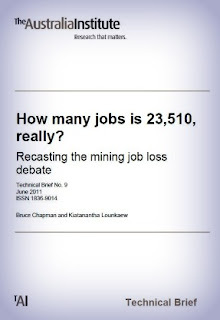 The report prepared for the Australia Institute also challenges the assumption that any mining workers who did lose their jobs would fall into unemployment. Using data from the household income and labour dynamics survey Professor Chapman finds that in the previous mining boom an enormous 26 per cent of mining industry employees left the industry each year. “On average around 36 per cent of people employed in mining are inflows, having arrived that year. Around 26 per cent are outflows - they won’t be there the next year,” he said. The seven-year longitudinal study finds that workers leaving mining almost always go to other jobs. “When you talk about job losses people think about about jobs actually being cut whereas the industry is talking about jobs that would not be created. You also think about people being sacked and going into long-term unemployment and becoming destitute. In the mining industry that is not correct,” Professor Chapman said. The report says the misuse of big-sounding jobs claims to describe very small effects is widespread. On Thursday before the Senate economics committee Treasury chief economist David Gruen defended the department’s decision to model the carbon tax assuming no change in the unemployment rate saying over the long term much bigger economic shocks had been shown to make no change to employment rates.